To Understand the “Democratic Revolution” and its impact on all human relationships, including parent/child and family relationships. Complete the BASIC Professional Certification Series. One of the series courses is offered each spring and fall in each of the cities in the 1, 2, 3 order listed below. This Series is offered in Boise, Lewiston and Pocatello. The courses may be taken in any order. The courses may be taken as a continuing education opportunity without the intent of completing certification. 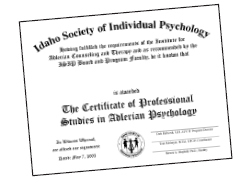 CERTIFICATE OF PROFESSIONAL STUDIES IN ADLERIAN PSYCHOLOGY and is eligible to register for ADVANCED courses. All workshops are conducted on a Friday and Saturday, provide for 12 CE hours approved by NBCC, and present an opportunity for one Graduate Continuing Education Credit through Northwest Nazarene University. Classes limited to 40 participants. The Series classes may be taken as a continuing education opportunity without the intent of completing certification.